Direct thermal printing process, so there's no need for messy, expensive ink or toner cartridges. Note: A minimum quantity of 70 must be ordered, and in units of 10 thereafter. 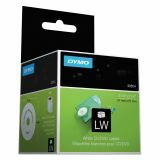 DYMO LabelWriter CD/DVD Labels, 2 1/4" dia, White, 160 Labels/Roll - CD/DVD labels are compatible with LabelWriter models EL60, Turbo and CoStar LabelWriter XL Plus, Turbo, 320, 330 and 330 Turbo. 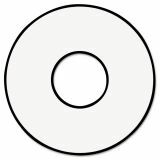 White labels are 2-1/4 in diameter. Apply as is or use a standard CD label applicator."